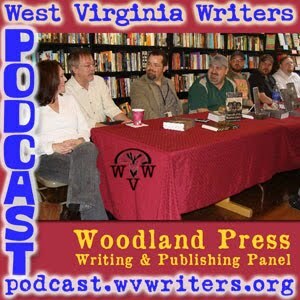 Podcast Episode 45 is a landmark recorded live reading of the Woodland Press Writing and Publishing Panel from October 23 at Taylor Books on Capitol Street in downtown Charleston. This is a panel designed to be a brief overview on publishing using a variety of methods from traditional to self-publishing as well as some of the ins and outs of the publishing business. Featured in the panel are Woodland Press authors Karin Fuller, Geoff Fuller, Eric Fritzius, Michael Knost, Jason L. Keene, Frank Lanerd and Brian J. Hatcher. The panel is led by 2010 Bram Stoker Award winner Michael Knost, editor with Woodland Press. Taylor Books, by the way, is a fantastic bookstore and they stock not only titles by Woodland Press but also WV Writers own anthology Seeking the Swan. Episode 44 is another of our patented Recorded Live Readings (Q: "But if it's recorded, how can it be live?" A: "What is this, the Inqusition? Get off it already.") 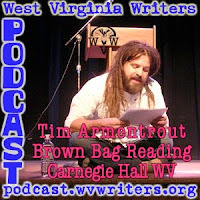 This one is a recording of Carnegie Hall's October Brown Bag Reading featuring poet Tim Armentrout. Tim reads from a variety of his poems and prose pieces. By the way, the Community Poetry Reading mentioned at the end of the podcast will take place at 7 p.m. on November 16, rather than 5:30 as stated.